Membership to the alumni association and Raiders Rojos is a minimum of $100, with $50 going towards your TTAA membership (Techsan magazine included) and $50 going towards Raiders Rojos programs that include: Hispanic Graduation Convocation, Homecoming Scholarship Recognition, and the annual Student Leadership Conference. 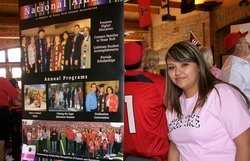 Our mission is to recruit and retain Hispanic students at Texas Tech through graduation. Select the Century Club $100 Membership level and enter RRA in the appeal code field to designate you are joining Raiders Rojos. The alumni association will credit $50 of your $100 Century membership to Raiders Rojos. Click here for on-line membership.